All transactions are safe and secure with a reliable history in online purchasing behind each of our associates. Buy the Dharma Stations Lost shirts to own Lost clothing and merchandise. The Dharma Stations Lost t-shirts feature almost all of the known Dharma Station logos. The logo designs include the Swan Station, Arrow Station, Staff Station, Pearl Station, Flame Station, Hydra Station, and Looking Glass Station. The main Dharma logo is also available. Don't be shy. 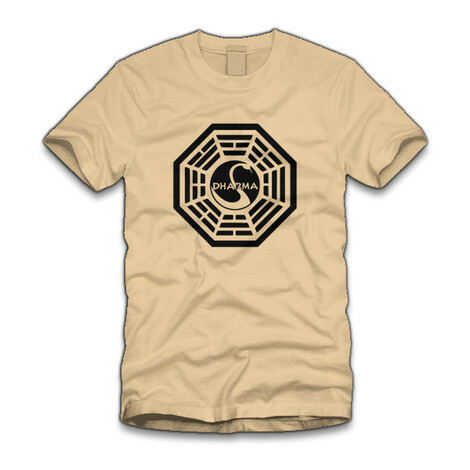 Let everyone know that you're a part of the Dharma Initiative. Just don't let them drink all of your Dharma Beer. Pair this apparel with Dharma Lost hats. In addition to the Dharma Stations Lost tees above, browse the Lost Clothing Gallery for more apparel like men's and women's clothes, kids shirts or hoodies.